Description: I've been trying to finish up a profile of this guy for 2 weeks. But, just haven't been able to get motivated to get it done. I like the idea of a bad wielding an axe as a weapon. But, I won't dare actually putting it in his hands. Both because of the gold paint and because the figure seems brittle like Brazilian Joes. I just saw you posted the link to the review on IG today- will have to give it a read, as I know nothing of him. Looks like he’d feel at home on a Cobra BUGG too. I've never actually seen a clear photo of this guy before! I like that you paired him with those De Aco Night Vipers, playing up his exoticness. 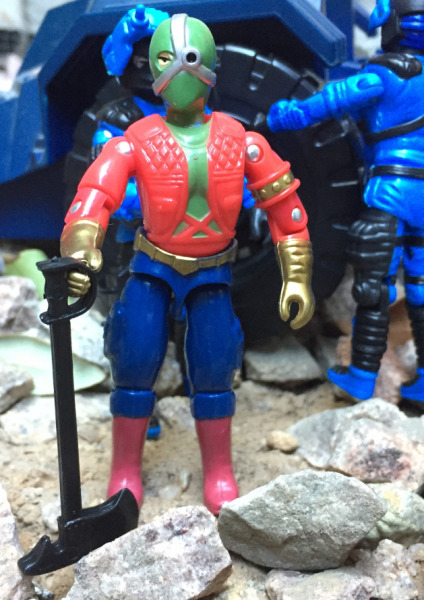 An oddity for sure, those power commandos are some of the most creative but still blatant knockoffs out there. Those Guys From The Other Galaxy, are great. Mummy Mask is my favourite!